Mundane things can inspire people so Nick is seen walking down the street and writing ideas in his sketchbook in the café. Nick explains that he is inspired by Leonardo da Vinci because he wasn’t just an artist but a scientist. Images of anatomical drawings are shown as the artist explains how Leonardo tried to find out what was going on inside us beneath the surface. View of faces in the street are compared with Nick’s portraits as he explains his portraits are quite like androids as they are angular. 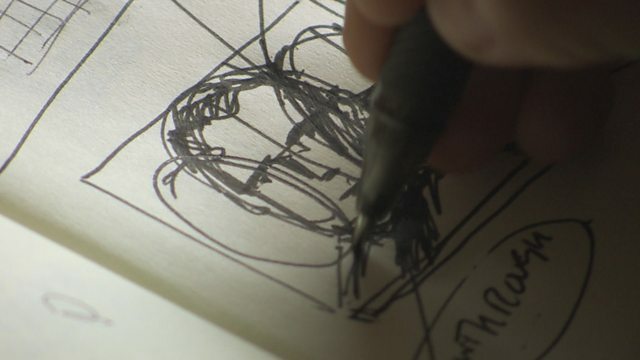 He jots down ideas in his moleskin sketchbook in pen followed by projected images of his notes and drawings.